MELATONIN is a hormone secreted by the pineal gland, an endocrine gland buried deep in the brain that regulates sleep. It is responsible for regulating biological rhythms in humans. Melatonin is a powerful antioxidant and free radical scavenger. There is evidence that Melatonin acts to support the immune system. As we age, the natural production of Melatonin tapers off. 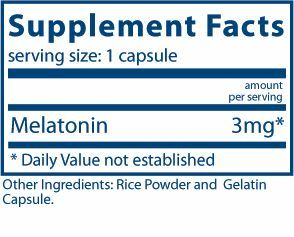 Recommended Dosage: 1 or 2 capsules at bedtime, or as directed by a healthcare practitioner. EXCLUDES: Coatings, Binders, *Gluten (wheat, rye, barley), *Milk/Dairy (casein, whey), *Soy Protein, *Egg Protein, Sugar. If pregnant or nursing, consult your physician before taking. © Copyright 2019 Professional Supplement Center, LLC, 5441 Palmer Crossing Circle, Sarasota, FL 34233. All rights reserved. Local time is 4/24/2019 12:34:43 PM.